THE first Shannon class RNLI lifeboat to go on service in Ireland was officially named on Saturday during a special ceremony in Buncrana. 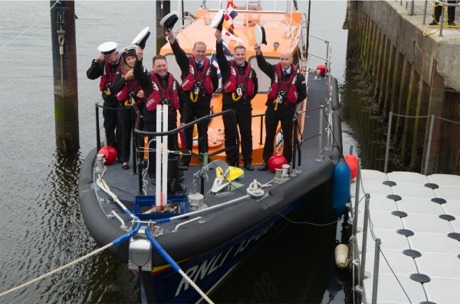 The €2.4m life-saving vessel which has already been on 19 call-outs since its arrival on the North West coast last year was officially named the ‘Derek Bullivant’ by the man responsible for getting the RNLI’s latest class of lifeboat named after an Irish river. Arklow man Jimmy Tyrrell was with the RNLI for 46 years, making him the charity’s longest serving lifeboat operations volunteer on his retirement. 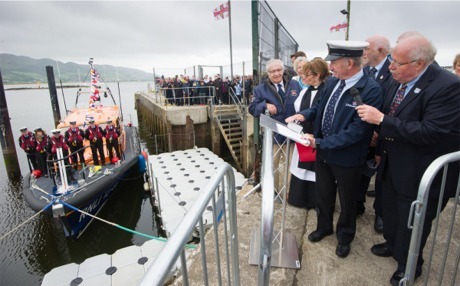 He was asked by Lough Swilly RNLI to officially name the lifeboat and he did so in the time-honoured tradition of pouring champagne over the bow of the lifeboat to cheers from the large crowd. RNLI honorary governor Jimmy Tyrrell officially names the Lough Swilly RNLI lifeboat 'Derek Bullivant' on June 25, 2016. It was an emotional day for Mr Tyrrell, whose family are well-known and respected boat builders. "During my lifeboat career I have seen many changes in lifeboats, from wood, to steel, to fibre-glass and to today’s composite construction. However, one thing that has not changed in the RNLI and that is its people. The basic commitment of crews is the same. Generations of them have put their lives on the line and sometimes lost their lives trying to help those in peril on the seas," said Mr Tyrell. Some of the Lough Swilly RNLI volunteer lifeboat crew on board their Shannon class lifeboat 'Derek Bullivant'. A small service of blessing led by Buncrana parish priest Fr Francis Bradley and Church of Ireland rector Reverend Judi McGaffin also took place. The 'Derek Bullivant' lifeboat was funded by legacies from Derek Bullivant and Valerie Walker. Lifeboat operations manager John McCarter said: "While we are in celebratory mood today God knows we have seen and been closely involved in our share of tragedy around our community, and we remember all those who have suffered great loss at the mercy of the sea. However at Lough Swilly RNLI it also strengthens our resolve to work harder and keep our equipment state of the art to enable us to provide search and rescue service around our coast. The 'Derek Bullivant' lifeboat is testament to that." Saturday was a "proud day" for Lough Swilly RNLI's 30 male and female volunteers. In its 29 year history, the local crew have launched 741 times, brought 568 people to safety and saved 49 lives, the ceremony was told.